School, Seattle, The Northwest… The World? I think the first time it happened was near the end of April last year. It was such a strange feeling and such an unexpected moment, to be recognized. It didn’t feel like fame, but I had no idea how else to put it. I thanked her, gave a real smile because I was grateful and honored, and went on with my day in a much better mood. But it’s happened over and over again since then. On Facebook, I have an album called “Food Photography.” It has around 250 comments and is “liked” by 40 people, many of whom I never talked to until they complimented me on my baking. I’ll be sitting in environmental science when someone will quietly complain, “I’m so hungry!” and give me a meaningful look. The sophomores who ride my bus smile at me and ask if I’ve made anything neat recently. And teachers stop me in the hallway to say they’ve heard about my blog, and could I please write down the address for them? Even though I’m a senior and my high school is relatively small, I’m not well known. I have classes with the same people over and over, and I’ve never been much of a social butterfly. 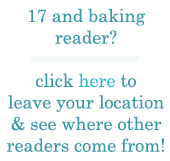 And I know I’ve said this before, but it’s true – when I first created 17 and Baking I didn’t tell anyone about it because I thought it was embarrassing. I didn’t think it would be cool to have a food blog. I thought people would think I was weird. So I kept it to myself and tried to hide it from the world. To my surprise, people didn’t think it was uncool or strange. Food is universal. Food brings people together. Because really, when it comes down to it, who can resist anything warm and fresh from the oven, whether a sweet chocolatey cookie or a soft chive-studded cream cheese biscuit? It was one of the most incredible things I’ve ever heard, to have spread not only through school and the food blogging world but to college students in California simply having a bake-off. It lifts me off my feet and makes the sun shine out of my heart. Thank you for reading my blog – thank you, thank you, thank you! Normally I wouldn’t, but I’ve got to ask – if you’re reading this, please leave a comment! Whether it’s your first time visiting or I’m welcoming you back, I’d really appreciate it if you left your location. I’m just curious to know where my readers are. I’ll start… Seattle, WA! I don’t often opt for savory over sweet, but breakfast is one of those things where I crave salt over sugar. I’d had my eye on these Chive Biscuits for a while when I decided to make them. Part of the appeal was the inclusion of buttermilk and cream cheese. More than anything, that made me think of soft, flaky, and savory biscuits. They didn’t get as tall as I expected, but with chives from our own backyard and a squiggle of clover honey, they felt like home. Return the dough to the work surface. Roll out as before, and repeat the folding process. Give the dough another quarter turn; roll out dough one more time, again into a rectangle about 1 inch thick. Using a sharp knife, divide the rectangle into 12 equal squares or rectangles. Place on prepared sheet about 1 1/2 inches apart. Refrigerate for 1 hour. Preheat the oven to 425 degrees F. Bake, rotating the sheet halfway through, until the biscuits are golden and flecked with brown spots, 15 to 18 minutes. Transfer the biscuits to a wire rack to cool. Entry filed under: Breakfast/Brunch. Tags: breakfast, chives, cream cheese, herbs, savory. Love your blog, both the recipes and the stories. Jacksonville, Florida. Wonderful blog! As the mother of four daughters, I’m so impressed with this young woman! Wow! Elissa, best of luck in everything you do! Doha, Qatar!! :) Nice blog! Great blog! I’ll be making the flag cake today. obtained in forested acres, jungles, streams, lakes, seas, and so forth. games and new platforms are also being developed. Tomorrow is the 4th of July, I’ll be making the Flag Cake for a BBQ :D I love your site & blog…keep it coming..
16 year old, food/fun blogger of Minnesota. exclusively, but there are reports of it not starting in some cases. More simply, there really is no concrete objective. I mean School, Seattle, The Northwest… The World? interested about what you’ve written. In my opinion, it could bring your blog a little livelier. I miss this blog, please come back!